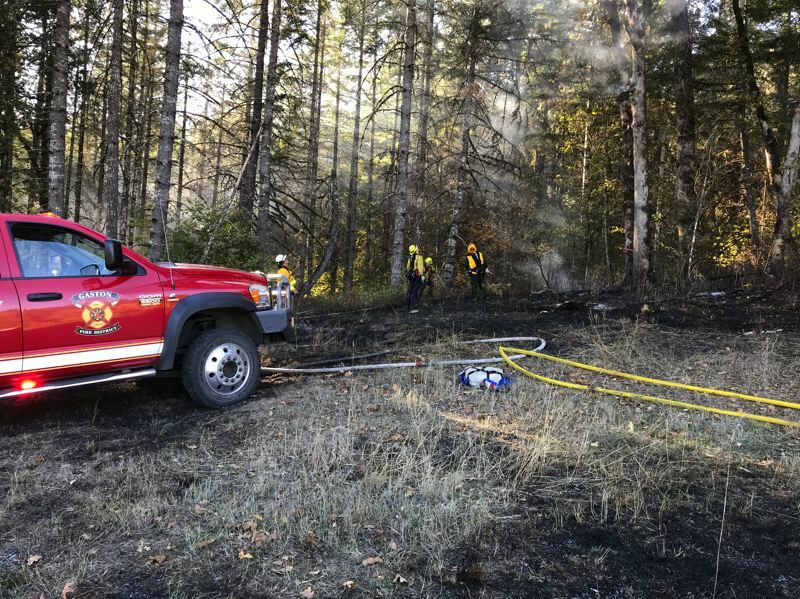 Two brush fires commanded the attention of western Washington County firefighters Wednesday afternoon. A person was transported to the hospital with symptoms of smoke inhalation from a two-acre fire in Cherry Grove on Wednesday, Oct. 17, according to Forest Grove Fire & Rescue. The fire agency said the person, whose identity was not released, was trying to extinguish flames on their property off Southwest Lee Road. The brush fire was ultimately brought under control by firefighters from multiple agencies, led by the Gaston Fire District, which responded at about 3:15 p.m. Wednesday. The brush fire was the second to which western Washington County firefighters were called Wednesday. Earlier in the afternoon, Forest Grove Fire & Rescue led a multi-agency response to a fire at a vineyard off Northwest Wilson School Road, near Gales Creek. That blaze was contained to about one acre, burning between rows at the vineyard. Forest Grove Fire & Rescue attributed the cause of both fires to out-of-control burn piles. Washington County fire agencies have lifted a burn ban that was in place for most of the summer, briefly lifted early this month, briefly reinstated, then lifted again. However, while outdoor burning is being permitted again, fire agencies still warn that burn piles must be supervised at all times, and precautionary steps should be taken to ensure they do not burn out of control or flare up after being extinguished. "At this time, burning in Washington County is allowed, but we highly suggest residents not burn until it is safe to do so," Forest Grove Fire & Rescue stated in a press release. "Use due diligence if you choose to burn, follow safety rules. Those safety rules are have a bare dirt break around the burn pile, never leave a burn pile unattended (EVER), always have a shovel and hose readily available."